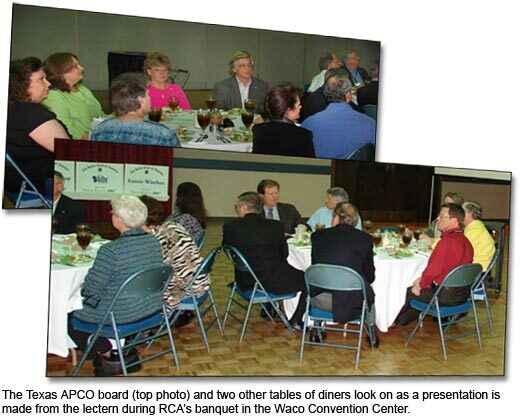 On April 17, RCA conducted its first Texas Dinner. 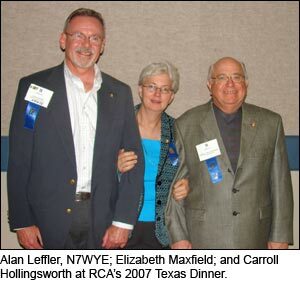 The Texas Event Committee, chaired by Carroll Hollingsworth, an RCA director, organized the dinner. “We had over 40 people there. It was well attended, with twice as many as we expected,” said Nancy Smith, who is a member of RCA and Texas APCO. 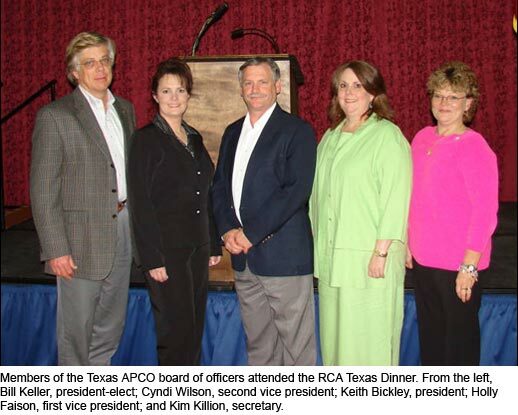 The RCA function was held during the Texas APCO State Conference and Exposition April 15-18 at the Waco Convention Center in Waco, Texas. “LMR — IT Convergence and Cooperation: The Keys to Interoperability,” presented by RCA member Roman Kaluta from Raleigh, North Carolina. Roman is the director of interoperability solutions and public safety liaison for Raytheon JPS Communications. “Overview of the P25 Standard,” presented by Gary Ranson of Daniels Electronics. “Analog vs. Digital Radio Testing,” presented by Bill Nichols of Aeroflex. Joe Hanna, president of Directions, gave a presentation that was not listed as having been arranged with the assistance of RCA, but I wanted to let you know about it, first, because Joe is a member, and it’s good to note when RCA members are active at conferences; and second, because the title of his presentation cannot be ignored: “Broadband–It’s Not Just for Real Estate Agents and Pedophiles Anymore.” Joe is an RCA Fellow and a past president of APCO. John Melcher delivered a speech during the dinner meeting. Mr. Melcher is executive vice president of external affairs at Cyren Call Communications and president and CEO of The Melcher Group. 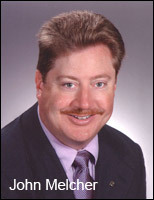 He retired in August 2005 as executive director for the Greater Harris County 9-1-1 Emergency Network in Houston. I wasn’t at the dinner to take notes of Mr. Melcher’s speech, which he delivered extemporaneously, and I could not reach him to obtain the speech’s highlights in his own words. Nancy gave me the following description of the speech by telephone. Thanks, Nancy. When Morgan went around talking with the public safety entities to learn for himself why we were having interference in the 800 MHz band — and this is how the rebanding was birthed — he heard firsthand for himself the real issues behind public safetys needs. First of all, theres spectrum; second of all is paying for everything. You no sooner get a new infrastructure paid for with public funds than you have to start working on an upgrade or replacement. The technology is moving so fast that public safety has difficulty keeping up with it. He recognized that. Thats why he took up the flag. Morgan OBrien told me himself — and I know he and John talked about this — he took this back to the board of directors at Nextel and talked about partitioning part of the spectrum they owned and building out a nationwide public safety infrastructure. Its different when its a public company that has to answer to shareholders. Morgan foresaw the public safety need. When he saw what was happening in the 700 MHz band and after rebanding is completed and how it bumps up against the 800 MHz section that NPSTC is being moved to, he saw the need for more spectrum there. The Public Safety Broadband Trust that is managed by any entity that collectively, together with public safety, will form a trust to manage the spectrum and have the infrastructure paid for by commercial people who would be big users on the system. Under normal circumstances they could share the capacity on public networks with public safety. Everybody shares the network; the difference would be in the infrastructure. Since its in public safetys interest, when there is a major catastrophe, public safety takes over priority and geographically would control the system for the duration of the incident. No one has been willing to give public safety priority on a public network. Yet that level of service and a different handset is required for public safety needs. The big battle today is to get the spectrum. If they dont get the spectrum out of the auction pool, the whole thing is a moot point. He got into more in depth when we went into the sessions that were conducted the following morning at the APCO breakout sessions than he did at the dinner meeting. He talked a lot about his role in talking to senators and congressmen and others to get them to grasp the capsule of how important this was and why it made a difference. Its amazing in public safety: Theres no issue, unless your house is on fire, or it’s your neighborhood someone is shooting up. Its been a tough message to deliver; yet I think theyve done a remarkable job in getting the information out there. There are a lot of questions unanswered about details because they havent ironed out who would sit on the board of directors for the Public Safety Broadband Trust. The biggest message today is that unless they can get the spectrum set aside and out of the auctionthey asked for 30 MHz, but if they only get 24 MHz, that would be great; the spectrum will be gone forever. This spectrum would be in addition to what public safety is already receiving from the 700 MHz band thats being cleared by the TV channels. If they can get the additional spectrum to form the Public Safety Broadband Trust, then everything moves forward from there. Cyren Call, even though they spearheaded the drive, would have to compete for managing the Public Safety Broadband Trust with all the other vendors that would be in a position to do that sort of thing. Public safety will have the opportunity to have their representatives on the board of directors and to be involved in the system design; driving the features and technology of the handset to meet their needs. Broadband is a big issue because today the cell phones that most of us use in our daily lives, have more sophistication and capability than the hand-helds the police, firefighters and emergency medical technicians have. Thats kind of scary. Johns presentation at the dinner was light hearted, yet it drove home how important it was to secure the additional spectrum for public safety. Thats the first battle, and it has been uphill. On public safetys behalf, John Melcher and Cyren Call are the flag bearers. Now there are many congressmen and legislators recognizing the light and getting it — that its about additional allocations for public safety, and getting it out of the hands of the auction, which is really imminent. My thanks to Nancy for that summary of Mr. Melcher’s speech. In addition to Nancy, several others helped with this story. Carroll sent photos that were taken at the banquet. I don’t know who took the pix, but whoever it was, thank you. Kyong Pae of Cyren Call Communications forwarded a picture of John Melcher, and Keith Bickley and Rebecca Rae of Texas APCO took time to lend a hand. Here are some more of the photos that Carroll sent. This entry was posted on Thursday, May 17th, 2007 at 9:30 pm and is filed under RCA meetings. You can follow any responses to this entry through the RSS 2.0 feed. You can leave a response, or trackback from your own site.